Atheneum Books for Young Readers, 9781442458734, 368pp. Travis Coates has a good head…on someone else’s shoulders. A touching, hilarious “tour de force of imagination and empathy” (Booklist, starred review) from John Corey Whaley, author of the Printz and Morris Award–winning Where Things Come Back. Listen—Travis Coates was alive once and then he wasn’t. The in between part is still a little fuzzy, but Travis can tell you that, at some point or another, his head got chopped off and shoved into a freezer in Denver, Colorado. Five years later, it was reattached to some other guy’s body, and well, here he is. Despite all logic, he’s still sixteen, but everything and everyone around him has changed. That includes his bedroom, his parents, his best friend, and his girlfriend. Or maybe she’s not his girlfriend anymore? That’s a bit fuzzy too. Looks like if the new Travis and the old Travis are ever going to find a way to exist together, there are going to be a few more scars. John Corey Whaley grew up in Louisiana. His debut novel, Where Things Come Back, was the 2012 winner of the Michael L. Printz and the William C. Morris Awards. You can learn more about him at JohnCoreyWhaley.com and follow him on Twitter: @Corey_Whaley. * "Travis Coates has lost his head—literally.... [A] wonderfully original, character-driven second novel. Whaley has written a tour de force of imagination and empathy, creating a boy for whom past, present, and future come together in an implied invitation to readers to wonder about the very nature of being. A sui generis novel of ideas, Noggin demands much of its readers, but it offers them equally rich rewards." "The madcap story of a boy who loses his head and finds it again. . . . Readers will recognize the Printz winner’s trademark lovable characterizations. . . . They’ll also recognize the poignantly rendered reflections on life, love, death and everything in between. . . . Whaley’s signature cadence and mad storytelling skillz are worth every page. A satisfyingly oddball Frankenstein-like tale of connectivity." * "Travis Coates has his head surgically removed and cryogenically frozen after he dies (of leukemia at age 16)...five years after his death, technological advances allow doctors to attach his head to a donor body that's taller and more muscular than the original.... Travis's comic determination to turn back the hands of time...is poignant and heartbreaking. His status in limbo will resonate with teens who feel the same frustration at being treated like kids and told to act like adults." "Whaley’s sweet and raunchy first-person narrative provides a thought-provoking look at the notions of self-awareness, the nature of identity, and the angst of a very special teen. The lively, conversational style will engage teen readers in search of an unusual, but relatable, character. At times hilarious and heart-wrenching, Noggin, with its eye-catching cover art, belongs in all library collections serving young adults." "Readers will find it easy to become invested in Travis’s second coming-of age—brimming with humor, pathos, and angst—and root for him to make peace with his new life." "The premise of the story is interesting. . . . The author does a good job of describing the emotions and reactions of all of the characters." * "What is it like to be frozen, à la Ted Williams, never believing you'll really come back--and then you do? 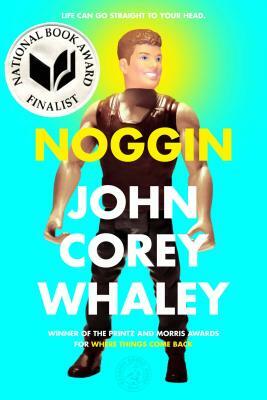 That's the preposterous premise of John Corey Whaley's novel, conveyed with realistic emotions that keep his narrator, Travis, grounded, and the story credible--and also highly entertaining--for readers. . . . Whaley makes his hero's implausible situation absolutely convincing. The questions lurking behind Travis's sometimes rash actions plague all teenagers. . . . Ultimately this insightful story explores the challenges of intimate relationships and managing expectations. Whaley asks teens to think about the life they want to make for themselves." "We weren't sure what to expect from this one, but were pleasantly surprised by honest, funny and incredibly likeable Travis. As a walking miracle, he should be grateful, but he struggles with feeling out of step in his own life. Noggin is filled with loving relationships that remind us that even with the kindest people and the best intentions, life is complicated."